Zopa operates an open market place where borrowers look for low cost loans and lenders seek high returns. As with any price discovery process there will be some volatility in the rates participants get as they seek agreement. 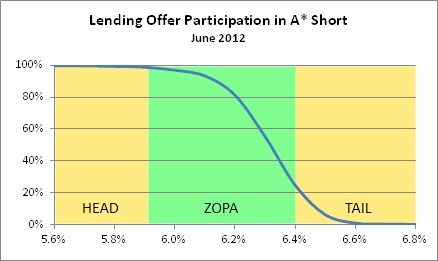 In any given month there will be a small number of loans agreed that are at exceptionally competitive rates (the head of the ZOPA) but also a small number of larger loans agreed that incorporate lending offers at high rates (the tail of the ZOPA). The extent of these head and tail regions can change from week to week and month to month because they are driven by outliers. The main body of the ZOPA however is where most of the action occurs and has been relatively stable, varying rather slowly over time. The new ZOPA is a measure of actual market activity, based on the last 30 days of actual loans reserved and disbursed and is updated daily. It cannot be used to predict the future with certainty but it can be used to forecast how fast your money will be lent out with some statistical confidence. To improve our level of confidence we need to chop off the outliers; the head and the tail. As a practical example, there is little benefit setting your rate at 5.6% in the A* Shorter market to be sure of participating in a 100% of loans when you can get 5.9% and still participate in 99% on average. Deciding on how to define the head and tail regions depends very much on how frequently you, the lender, are prepared to adjust your rates. Some Zopa lenders check their offers daily while others check what’s going on every month or two. However, the typical lender logs in and checks their lending offer about once a week and based on data from the first 6 months of this year we are defining the ZOPA as being between 99% and 20% participation. This produces a good balance between making sure you will participate in loans over the next week at either end of the ZOPA while still getting the best rates available. One final point – the lending forecast is to 2 decimal places and is not rounded to the nearest £10 even though you can only lend in £10 units. We’ve debated this but have left it like that because we feel it emphasises these figures are averages over time and not to-the-£ predictions. If the lending forecast is £5.50 then it doesn’t mean you will lend out £5.50 in the next week but you would lend out £5.50 on average over several weeks. Another way of thinking about it is you have a 55% chance of lending out £10 in the next week. It’s a small point and maybe it will confuse people after all, but let’s see how it goes.